Complex NPK fertilizer with Magnesium and Trace elements. Complete type 2:1:1 that fully satisfies the high Nitrogen requirements of cultures, during the first stages of their installation or at the beginning of the annual vegetative circle. 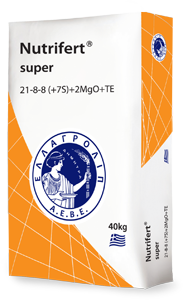 The balanced combination of Phosphorus and Potassium ensures efficient root system growth and provides the required nutritious sufficiency for optimum transition to the reproductive phase. It is enriched with Magnesium and Trace elements, provides complete nutrition and increases the robustness and the culture yield. Ideal for the basic fertilization of cotton, spring cereals, olive trees as well as Arboriculture in general. 12 - 12 - 12 ( + 35 ) + 10% Ο.Υ.